Ahmadabad is emerging as one of the fastest growing economic powerhouses of the country, leading the way in transforming Gujarat from a state of traders to a magnet of heavy industry and tech-driven startups. As the city is working towards new sustainable development goals, the demand for professionals who can manage the businesses effectively is rising exponentially and Ahmadabad hosts a good number of reputed educational institutions that are central to producing those professionals. With over 32 years of experience in imparting quality education, St. Kabir Educational Institutions is one of major educational bodies in Ahmadabad. The group runs five institutions today and has been engaged with 6500 students, 500 academicians, 7500 alumni and 221 corporate recruiters since its inception in 1985. Today, the institutions under the brand St. Kabir are not only known within the city premises, but are nationally acclaimed. One such example is St. Kabir Institute of Professional Studies (SKIPS), a premier business school offering a two-year full-time Post Graduate Diploma in Management with a student centric learning pedagogy. In a bid to strike a fine balance between the demands of domestic industry and the global perspective of business education, SKIPS gives its students due exposure to international management practices while maintaining relevance to the country's culture and economy. "Our plan of action involves, Thinking globally, working locally, which makes us aware of every developments that occurs in the market and train our students to cope up with such situations in their career," says Dr. Ram Kumar Balyan, Director, SKIPS. Students not only learn the latest theories and approaches of management at SKIPS, but also get opportunities to interact with leading business tycoons. Such an amalgam of academics and pragmatic approach makes students of SKIPS highly employable and an asset for the industries. Students not only learn the latest theories and approaches of management at SKIPS, but also get opportunities to interact with leading business tycoons. "The experience that I underwent at SKIPS has helped me design a career that I am proud of. A balanced blend of academic and non-academic activities defines the pedagogy at SKIPS. I was given the opportunity to test my mettle in the varied activities, whether it is in academics, sports or extra-curricular activities," shares Mohammed Saad Munshi, alumni of SKIPS who works as a Senior Executive at Naukri.com. The pronounced presence of SKIPS alumni members in various industries also bears testimony to the excellence imparted by the institute. While SKIPS is considered as a bridge between industries and the future work force, the management takes legitimate pride in its well-placed students. This can be clearly visible in the 100 percent placement record and the number of blue-chip companies, and organizations from various sectors that pour in interest by recruiting SKIPS's students. The placement scenarios of SKIPS, however, has changed in the recent times as there are more students now opting to become their own boss instead of joining the larger community of professionals who have opted to work under a boss. Sant Kabir Open Platform for Entrepreneurs, better known as SKOPE, has been highly successful in offering the much-needed entrepreneurial guidance. SKOPE invites industrial experts and leading entrepreneurs deliver workshops, lectures and proven practices in their ventures, while allowing students to display their new ideas and innovation. This platform has proved to be very fruitful for those who want to be entrepreneurs and have independent ventures of their own. Keeping student's requirement and the latest developments in the field of management studies as the highest priorities, the SKIPS proves that real management is not just about getting an MBA from a business school and has henceforth emerged as the most sought-after institution for business studies. To carry this vision forward, the institute has employed self-motivated and dedicated faculty members and according to Dr. Balyan, they are not just mere tutors and pinpoints, "They are extraordinary educators and such a dedicated team gives our PGDM program an edge." While most of the faculty members have spent considerable amount of time in the industry before joining the institute, the management has given opportunities to its faculty members to interact and experience a new set of skills by involving them in live projects, guiding students and interacting with peers and industry personnel. Dr. Balyan had been a Telecom Engineer in Indian Air Force for 20 years. Thereafter he joined Shyam Telecom. He took to teaching during his service period in defense and this interest led him to a fully-fledged teaching career. 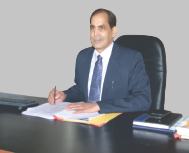 He has been associated with an affiliate Gujarat University and later on with St. Kabir Institute of Professional Studies, where he is currently serving as Director.